Social media users alerted the employer of 28-year-old Ryan Roy of Burlington, Vermont, to his participation at the Charlottesville rally that included members of hate groups. Social media shaming apparently contributed to a white nationalist losing his job. 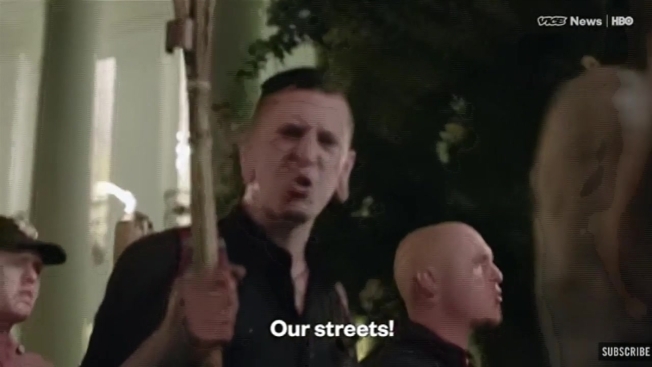 Ryan Roy, 28, of Burlington, Vermont, was seen chanting in an episode of the HBO newsmagazine show “VICE News Tonight,” filmed in Charlottesville, Virginia last weekend. Roy, who described himself to the Burlington Free Press as admiring white nationalism and favoring segregation based on race, was protesting the removal of a Confederate statue. He appeared in the Vice report alongside neo-Nazis, KKK members, and others. The following day, demonstrations turned deadly. Heather Heyer, 32, who was demonstrating against the presence of hate groups in Charlottesville, was killed when a suspected white supremacist allegedly plowed into a group of counter-protesters. Nineteen others were injured. Twitter and Facebook users who were sickened by the actions of the white nationalists were able to identify Roy from the VICE video. The social media users took to their accounts to call on the Uno Pizzeria & Grill in South Burlington to fire Roy from his job in the kitchen there. Tuesday afternoon, the restaurant chain acknowledged tweets sent to the company alerting it to Roy’s employment, thanking the social media users for letting the company know and assuring them Uno was investigating. In a written statement to necn and NBC Boston Wednesday, the restaurant chain confirmed Roy was gone from the South Burlington location. On Twitter, some users said Roy was entitled to his personal views, suggesting he didn’t deserve to lose his job for having appeared in the episode of VICE. However, the authors of tweets denouncing Roy’s behavior remained steadfast, saying the fired employee’s attitude on the video was indefensible. Elaine Young, a digital marketing professor at Champlain College's Stiller School of Business, often discusses in her courses the impact of social media. “You might want to call it social media activism,” Young observed of the type of behavior many social media users employed to identify people whose behavior in Charlottesville they found objectionable. Young said she is a big proponent of equality and called the torch-carrying display seen on VICE and in other nationally-televised reports a terribly sad moment for the nation. Still, she said she worries some people could end up misidentified through the kind of social media shaming that contributed to Roy losing his job. As for the fired Uno worker, he appeared unrepentant in his interview with the Burlington Free Press, blaming counter-protesters for the violence in Virginia. Ryan Roy told Free Press reporter April McCullum, “The left in this country is trying to destroy white culture and white heritage and American heritage, because history doesn’t fit their politically correct scenario." “We roundly reject racism and white supremacy,” said James Duff Lyall, the executive director of the American Civil Liberties of Vermont. The ACLU stands against restrictions on free speech—specifically, from government infringement. Lyall noted the First Amendment generally does not guide how businesses like Uno handle employees’ behavior. “Private employers have more leeway to decide their codes of conduct,” Lyall said, drawing a distinction between a business’s choice and government suppression of free speech. Young observed that in 2017, if someone is willing to say anything potentially fiery in public, they need to be ready for the consequences.